We hope you enjoy your shopping experience at Laurie Ann's Candies. We have a variety of goodies that are made fresh to order and delivered right to your door. Orders can also be shipped to another address with a gift card enclosure if that is what you need. 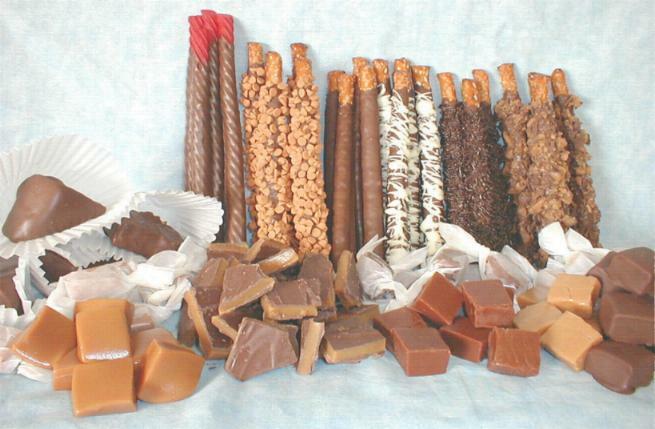 At Laurie Ann's Candies, we specialize in homemade toffee, caramels, cherry nut chunk, peppermint marshmallows, chocolate covered pretzels and chocolate covered red vine licorice. One taste and you will be as passionate about our product as we are. 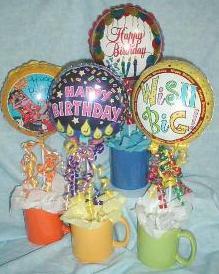 The coffee mugs with balloons shown above can be ordered for any occasion, birthday, anniversary, thank you, congratulations, etc. It's a very reasonable gift, priced at just $12 (plus shipping). Click on the picture to be redirected to make your selection! We also have a large variety of boxes, bags, balloons and mugs that will add a very special touch needed for gift giving. To view our products, simply click on one of the links above. You can shop by individual items, gift items or by the latest seasonal/special events selection. As the holidays and special events change throughout the year, so will some of our selections. Please sign up for our mailing list so that we can notify you of our specials and new products. All orders are processed through PayPal for payment. This is a fantastic service because you don't need a PayPal account to utilize this service. If you have an item that you would like to "special order", more than likely, we can fill your order, just submit an email through our "contact us" page and we'll respond within 2 business days of receipt of your email. Copyright © 2018, Laurie Ann's Candies. All rights reserved.